After much usage, an Ecofan motor can wear out. Motor Replacement Kits are available for consumers who wish to install a new motor rather than sending the old unit back to Calfire for repair or purchasing a new Ecofan. The replacement task is straight forward; however on some older models the consumer must have the capability to solder the new motor to the existing wires. The replacement kit comprises a new motor; an allen/hex key to remove the blade and full instructions. ES006 Motor Replacement Kit for Ecofan Models 800,802,806 (pre 2014 version) and 815. 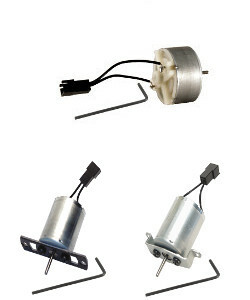 ES009 Motor Replacement Kit for Ecofan models 810 & 812.